Since I am still working on last month’s marathon report, my goal with this post is to knock it out in one day. This seems realistic, as my right foot hurts so much, there’s not much I can do today anyway. 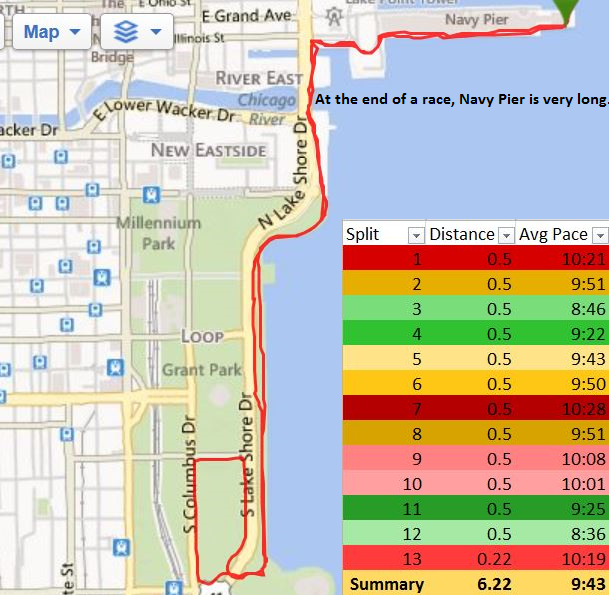 Splits are color coded from fastest (light green) to slowest (dark red). The race started slowly, due to crowding. Alas, my last .2 was also slow due to injury. Curse those extra 24 seconds! 5am wake-up. Oatmeal had soaked in almond milk the night before, so did not take long to cook. I added walnuts, dried cranberries, and brown sugar to the bowl, washed it down with two cups of leftover half-caf microwaved coffee, and dithered around in hopes of lightening the intestinal load. * Goal achieved, I got dressed, grabbed some essentials, and biked to Tamra’s house. Getting ready and out was much mellower than for the marathon. By 6:20, Tamra’s micro-van was rolling, with Clare, Chiayu, and me as warm, grateful passengers. I enjoy the occasional petrol assist, especially when the car seats are full. Driving, parking, peeing, and gear-checking were done by about 7:10, which gave us time to loll about in the sunny expo area. One nice thing about this little race is that you get to wait indoors for the start. Thumbs up, also, to the event shirt—a long sleeve, black hoody made of thin material, a perfect non-bulky barrier to a mild chill. As the 10K start approached, we went our different ways, with Clare waiting behind for her race, and Tamra and Chiayu not needing to pee again. In regular life, I can go hours without hitting the bathroom, but races seem to shrink my bladder to an extent not even justified by the extra water intake. Before the countdown, we heard from a representative of Gateway Cancer Research, the event’s charity beneficiary. This was soon followed by an odd announcement from the emcee: “I see three people near the start line without race bibs! Since this is a charity event, (pause) that is just shameful!” An awkward silence fell over the crowd, and then we were off. First half mile or so: Construction fences along the pier and then the sidewalk on Lower Wacker hemmed the 1,500 runners into a slow moving stream. Even though I have not run a lot since the marathon, I was counting on strength from the recent miles to position me for a personal best of at least (rather, no longer than), 58 minutes, having finally cracked an hour at this January’s Polar Dash. At first I was aggravated by the plodding pace, but there was nothing to be done. I was impressed by the general lack of griping. Next mile or so: Spaces opened and my pace improved to high 8s and low 9s. The sun was shining, the lake was shimmering, the leaves were glowing, and the skyline was, uh, growing? Sure, I’ll go with that; the buildings did *look* bigger as we moved our way south. Because I did not want to lose momentum, I skipped the first water station. This was a tactical error as there was no other water station until we circled back to hit that one again at about mile 4. Not a big deal. Last third: Combos of head and tail winds, and my pace fell off a bit. But, sneaking in under an hour seemed possible. Emboldened, I attempted a “kick” and sped up, methodically overtaking people. Woman in blue. Man in jacket. Waifish teenager. As we got closer to Navy Pier, I exulted: “I can totally do this!” And then, in one of those narratively handy, hubris induced turns of fate, I yelped in surprised, acute pain. My right arch had cramped (thank you, latent plantar faciitus), and my left knee seized up. I was so close to the finish, or at least thought I was. Navy Pier felt muuuch longer coming in than going out. I limped quickly along, with my eyes bouncing between my watch and the horizon, no finish line in sight. The numbers on my watch kept changing with no care for my predicament. At the far, eastern tip of the pier, I finally saw the finish right as the number 1 flashed into the hour mark. According to both my watch and official time, I finished in 1 hour, 24 seconds. But bummed as I was, I was not focused on time. I grabbed a banana and water and looked in vain for a medic. I am not sure what a medic would have done—maybe help me limp back into the expo area and give me ice and ibuprofen? Somehow I made it back to gear check/our rendezvous point on my own and was happy to see the Accelerated Physical Therapy folks doing post-race stretches. I put my name in the queue, found Tamra, briefed her on where I would be, and leaned on a post until called. In summary: Even though the plantar faciitus has not been bothering me much, if at all, lately, it likely flared up when I laid down the hammer and really put some effort into the run. Since this is what I want to do more of, I should probably take the injury, and whatever is happening to my left knee, a little more seriously—maybe get some PT, take a break from running, consider buying one of those weird looking traction socks for sleeping, steel up my nerves for more icing, and ride my bike downtown more often to combat the loss in exercise. Bah. Who cares about times when you get to spend times with friends? All that aside, it was a glorious morning. 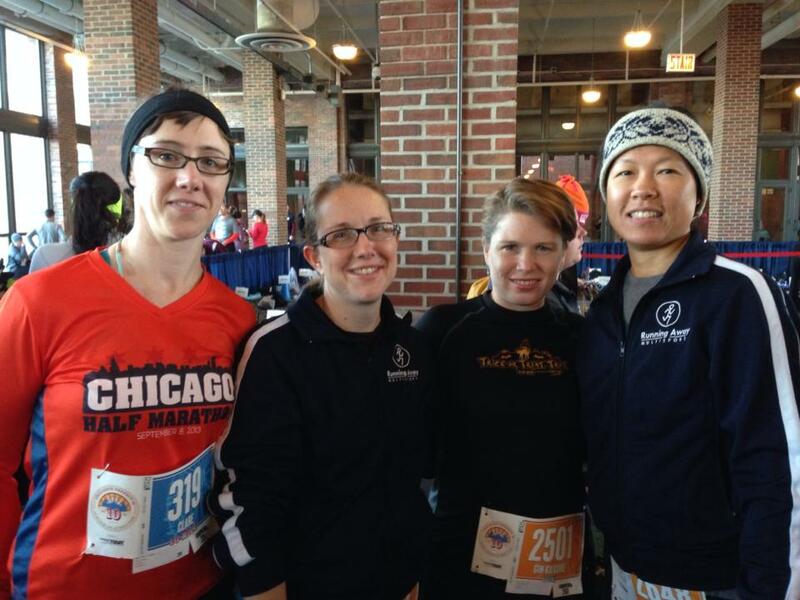 And Tamra and Chiayu completed their first 10K—the longest distance either had ever run. Woo-hoo! Clare brought me home for her husband’s traditional post-race waffle brunch in their sun-soaked dining nook and got me situated with an ice bucket for my feet and an ice girdle for my knee. ** And even though I am disappointed in my time, I came in 31 out of 148 (top 20%) in my cohort of 40-44 year old women. To have been in the top ten, I would have only needed a time of 56:25. I am totally going to crush that next year! I just hope Clare sticks with the 10 mile to reduce my competition. *As my two loyal readers, and most any runner knows, poop is a variable not to be ignored. **Clare, who suffers from back pain, is crafty. She fills a stocking with bags of frozen veges and ties it around her back. As always, Gin, I enjoyed your running tale. Each race is unique in that something new is thrown at the runner, which is the wild card part of the experience. You had some pretty fast miles in that 10K, which I find impressive with the marathon not so far in the past. Now write that marathon piece before you start to forget it!